/ Modified jan 8, 2018 4:18 p.m.
Construction on memorial for mass shooting expected to start later this year. 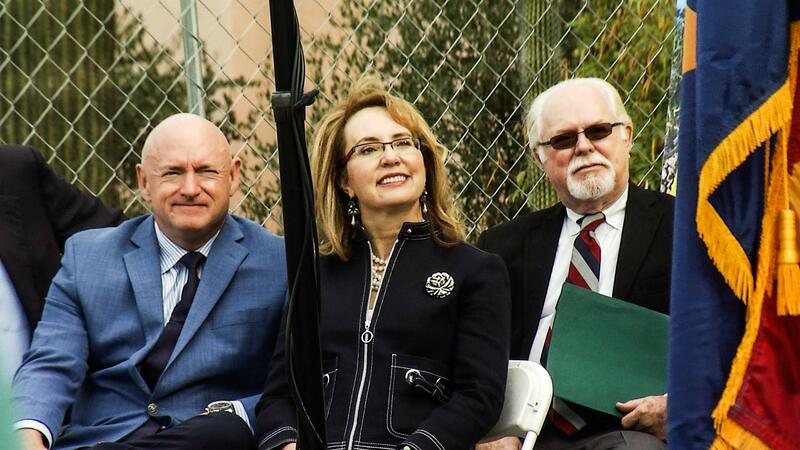 Mark Kelly, Gabrielle Giffords and Ron Barber at a memorial for the 2011 mass shooting in Tucson, Jan. 8, 2018. Tucson community leaders gathered Monday to dedicate the site of a planned memorial for the victims of the mass shooting seven years ago that killed six people and wounded 13 others, including then-congresswoman Gabrielle Giffords. At 10:11 am, the time the shooting occurred, the bell on the main fire station was rung 19 times, once for each of the victims. Mark Kelly, Giffords' husband, honored the memory of the youngest victim, Christina Taylor-Green, "who is 9 years old and was born on 9/11, and had very high-minded ideas about service and democracy, and deserved an entire life committed to advancing them," Kelly said. "Jan. 8, 2011 changed my life forever, and the lives of so many others. We honor those who lost, those who lost their lives and those who were hurt," Giffords said. The gunman received multiple life sentences. The memorial honoring the victims, and those who worked to save them, is planned for downtown's El Presidio Park, next to the old Pima County Courthouse. Backers hope to start construction later this year.